Tuesday Two Minute Tutorial: Remoulade Sauce! This week, The Dads want to encourage you to make your own sauces! Why buy store bought when you can make homemade quick & easy for less money? Bonus: The taste is so much better! We made a Remoulade Sauce this morning since our friends will be coming for dinner tonight. The first course that we will be serving is an avocado sliced on the plate, topped with jumbo lump crab meat that has been tossed in this fantastic Remoulade Sauce! When you make your own sauces, do you follow the recipe or add your own twists? What’s your favorite to make? Watch The Dads video below for our tips and tricks! One of our favorite followers, Chris from Key West, has asked us to show him how we make our Pasta Carbonara! The thing is… that he actually asked us this a couple of months ago! We feel awful that it took so long to get up here, but truthfully this is not a dish for the diet conscious! So we waited to make it for when we had guests over to share the indulgence! 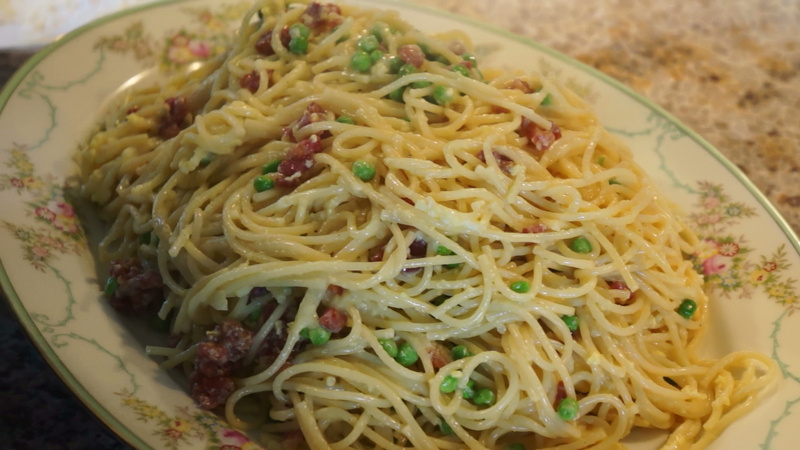 Here in the video, Harris shows you how to make a perfect Pasta Carbonara! See below for the recipe! While our recipe calls for Hog Jowl, aka Guanciale at the Italian market, you can use Pancetta or a quality bacon. The Dads Tip: Guanciale is our first choice, but it may be difficult to find. Try your local pork butcher. Also, adding half the olive oil at the end adds that fresh olive oil flavor! Bring 6 quarts of water to boil in a large pot and add 2 Tablespoons salt to the pasta water. Cook the spaghetti/pasta in the boiling water until just al dente. Meanwhile, combine half the olive oil and bacon/pancetta in a 12- to 14-inch skillet on medium heat. Cook until the bacon/pancetta has rendered its fat and is crispy and golden. Place cooked pork on paper towels to drain, set aside. Retain about half of the dripping for coating the cooked pasta. In a bowl, mix together the cheese, eggs, and pepper until smooth. We like to add just a little bit of the hot pasta water to help temper the egg mixture. This will prevent the eggs from cooking when added to the hot pasta. When the pasta is done, reserve a cup of the pasta water. Drain the pasta and place it in a bowl or back into the pot. While the pasta is still really hot, slowly drizzle in the egg mixture, stirring the pasta the whole time. The sauce will become very creamy as it coats the pasta. If you need to loosen it up a bit, you can add some of the reserved pasta water. Now add the peas (optional) and crispy bacon to the mixture. Serve immediately and sprinkle the top with remaining Parmigiano-Reggiano cheese! Our Secret Ingredient: Beef Demi Glace! Do you want a richer gravy or a more flavorful sauce? Then you need to try our secret ingredient: Beef Demi Glace from William Sonoma. Just the littlest bit of this magical product with transform even a simple dish into luxurious one. Seriously. Don’t believe us? Try a spoonful in your next gravy. William Sonoma offers four flavors: Beef, Veal, Chicken, and Vegetable. Check out Harris’ review below to learn more! For this week, we have a guest tutorial from Leah, Harris’ daughter. In the video below, Leah demonstrates how to make fresh whipped cream, infused with Grand Marnier. If you decide to give it a try, just beat 1 cup of whipping cream, 2 tablespoons confectioner’s sugar, and 1 teaspoon of whatever flavor you prefer. Feel free to warm up any flavor with vanilla as well. If you love this tip from The Dads’, be sure to “Like” us on Facebook or “Follow” us on WordPress by clicking the link in the right sidebar to receive our e-mails! We’re back! After some relaxing in Key West, we are very excited to share with you this week’s Tuesday Two Minute Tutorial: How to make Simple Syrup. Spring is in the air and we are ready for cocktails! Simple Syrup is an ingredient in so many of our favorites, but we can’t figure out why so many people buy it in the store. Not only is it very inexpensive and quick to make, simple syrup can be stored easily in your fridge. And the best part? You will only need equal parts of sugar and water! Simply heat on the stove until the sugar has dissolved, then store in a Mason jar. Watch the video below and you will be making mint juleps and mojitos in no time! Did you know Avocados are listed among one of the healthiest and best foods in the world? It’s true! Today we’re demonstrating to you just how simple it is to pit your avocado, slice or chop for your next meal. We Quinoa believe how tasty Quinoa can be! Quinoa: It looks like a grain, it cooks like a grain, it even fills you up like a grain, but this high protein, gluten-free seed is packed with nutrients and amino acids. It can even replace rice in most dishes. So, it makes sense that such a beneficial ingredient is so popular, but we had to know: can it taste good? Yes. Seriously. Quinoa’t are we talking ’bout?! (Quinoa is pronounced Keen-Wah, in case you were wondering.) Well, here at HarrisandDave.com, we put together a few test recipes. We wanted something healthy that we could eat, but tasty enough for company. We came up with Mushroom Quinoa with Roasted Butternut Squash & Fennel. It’s our favorite way to enjoy this superfood. Maybe it will be yours too? Give it a try and we promise we won’t make anymore quinoa puns. Rinse your quinoa in a sieve. This is an important step to ensure all of the coating of bitter-tasting saponins have been removed from the quinoa seeds. Place the rinsed quinoa into your rice cooker or medium saucepan and add the water and chicken stock. If cooking in a rice cooker, press the cook button and wait for quinoa to fully cook. If using the traditional method of a saucepan; bring to a boil. Cover, reduce heat, and simmer for 10 minutes or until liquid is absorbed. 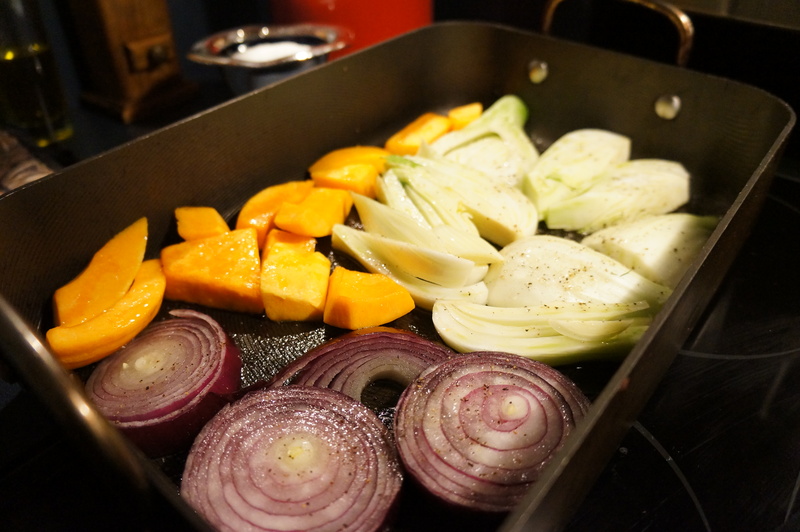 Meanwhile, place your chopped butternut squash, fennel and red onion on a roasting pan and lightly coat with olive oil and sprinkle with salt and pepper to taste. Place into 400 degree oven and roast until tender and caramelized; about 20 minutes. Stir part way through cooking time to ensure even caramelization. While your vegetables are roasting and the quinoa is cooking, melt butter in large sauté pan or skillet over medium-high heat. When the butter is hot, add the mushrooms and sauté. Add Worcestershire sauce, salt & pepper to taste. Cook mushrooms until tender; about 5 minutes. Fluff the quinoa with a fork and combine the mushroom and place onto a large serving platter. Place on top of the mushroom quinoa the roasted vegetables, adjust seasoning (I sometimes like fresh olive oil) and serve. WE are two dads who share: a home, a love for their children, a poodle named Jacques, a koi fish pond... and a love for cooking, gardening, home decor & partying! We are The Dads: Harris & Dave! Tuesday Two Minute Tutorial: How to properly store your herbs for longer lasting freshness! Eggplant & Feta with pine nuts and basil appetizer! True to Harris’ Italian roots ~ Cioppino, Italian Seafood Stew! The Harris & Dave Review! Joie de Vivre: Joy of Life! Quick Tips from Harris & Dave! The Dads Love to Entertain! Videos from Harris & Dave! Enter your email address bellow to follow this blog and receive notifications of new posts by email. If the box does not appear, look to the bottom right corner for a grey "Follow" button.